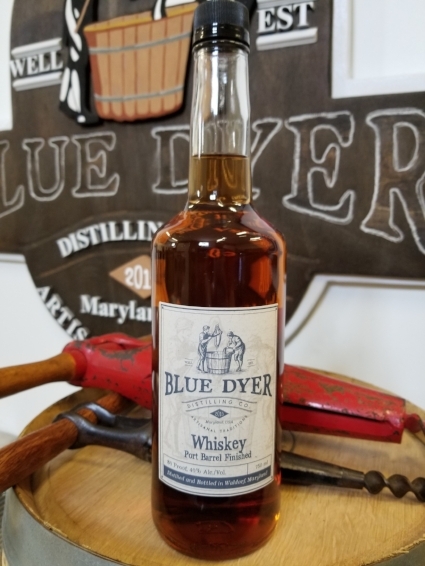 Port Barrel Finished Whiskey — bluedyer distilling co.
BlueDyer Distilling Co. "Whiskey Port Barrel Finished" is handcrafted from a mash bill of 80% Corn, 7% Rye and 13% Malted Barley. This whiskey is distilled four times before being aged on heavy char oak, followed by four months of finishing in freshly emptied Tawny Port Wine casks especially sourced for us by the Opici Wine Family. Our Port Barrel Finished Whiskey starts with smooth and mellow oak and grain character and finishes with hints of cherries, chocolate and red wine grapes. Currently a twice annual limited release, please enjoy our Port Barrel Finished Whiskey on the rocks, neat, with your favorite cigar, and responsibly. Cheers! !